The Spirit of a Man workshop will support you in being able to identify, master and command your inner forces and inherent power; the invisible realities that support or hinder your capacity to create a meaningful life. Be open to the possibility that there are some parts of you that you may not be aware exist and/or don’t know how they work for you or against you. how it works or does not work for you. Be ready and willing to Conquer and Master your inner forces; your True Power. Be ready to live fearlessly in every area of your life. Have a clear intention for what you want to be, do have the experiences you desire as a result of attending this workshop. Change the investments you make on a daily basis so that you receive better short and long returns of your investments. When you clarify the guiding principles of your life, you change the things and people in which you invest in moment-by-moment. You will maintain your dignity; You will be honored and respected as a man. You will discover more about who you are and the man you want to be in this life. Your trust and confidences will not be violated. You will be accepted as who you are, where you are. You will have a deeper experience of brotherhood. You will have a renewed connection to your own expression of spirituality, whatever that is for you. What you do with the opportunity of your life? Without the inner work, you will follow the stream of conscious that makes up who you are, what you are capable of and what is expected of you and for you. The stream may come from your parents or family history; or, it may come from the expectations of society and those in your environment; or you may make it up out of necessity. What is the stream of consciousness that is most prevalent in your life, affairs, and the world? The truth is that things of a spiritual nature, spiritual principles and spiritual practices balance brain chemistry so that the right and left hemispheres of the brain work in harmony to produce greater results. As we look at the world today, at the images and identities of men that are celebrated, there seems to be a breakdown. We see that men can be in their minds, in a head space, about the necessity and practice of certain values and principles that do not always yield good results. 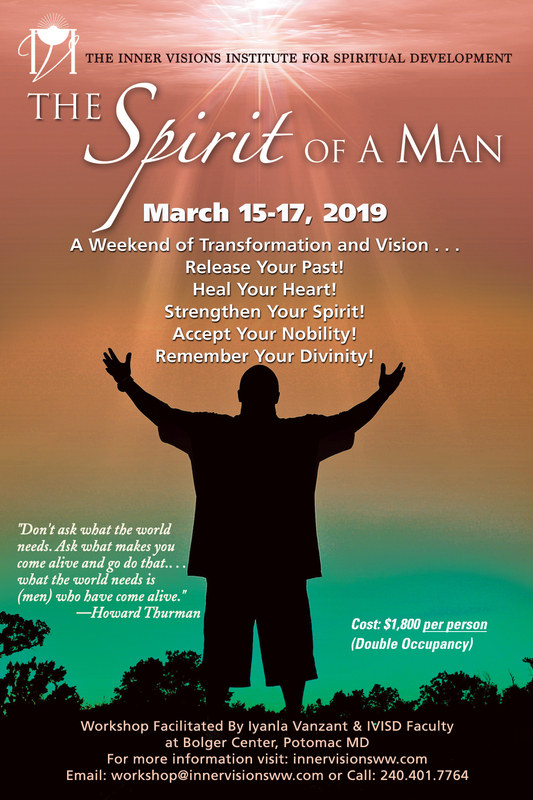 The sacred work facilitated at the Spirit of a Man workshop is an opportunity to anchor those values and principles in your heart and soul so that you will be equipped to change the trajectory of your life. What Is the Agenda of the Workshop? If an autopsy is a procedure and process engaged to determine why or how a person has died – – what is the procedure, process or practice that determines why we live; how we live? What is it that will cause you to stand up for yourself, inside of yourself and within your life? We call the process a man’s “sacred work.” This workshop is designed for men to do their sacred work in the company of other men. The agenda is determined by the needs and intentions of the men that attend. Men seem to be comfortable connecting and competing in the arena of athletics where they are affirmed. The field or the court are safe spaces for men to explore a wide range of their emotions. Tears, verbal outrage or physical aggressiveness regarding victory or defeat is expected and understood. Men can also explore a variety of emotions and expressions during sexual encounters. Anger, competition or arrogance in the workplace is also accepted and often, expected. There are places where the “killer instinct” among men is welcomed. However, when it comes to being vulnerable, authentic, compassionate; these values are often considered soft and unmanly. This workshop will support you in understanding the sacred wisdom, power, and benefit of mastering some of the “soft” values. How Can Women Teach Me About Being a Better Man? It is important to remember that women/mothers are the first teachers. A mother teaches her male child about himself and the world with her subtle ways of being. The women who facilitate this workshop are present to serve, not to teach. At the Spirit of a Man workshop the female “God Squad” creates and supports the environment in which you, in the company of other men, will discover a new depth of your authentic identity and power as a man. Through your participation and intention, you create the energy and depth of the process that determines your personal rewards. Why Is the Workshop So Expensive? While the dollar amount may seem high, it is an investment. You are investing in yourself, your life, your future and the lives of everyone you touch. On the other side, there are the realities of today’s world. It is expensive to rent a facility that is conducive to and has the environment that is honorable and respectful of the sacred work we do and the audience we serve. It is expensive to market and promote an event. It is also expensive to travel and house the staff required to facilitate the workshop. The registration fee we charge covers your lodging, meals, materials and the other expenses required to host the workshop. This is not a profit making venture. It is a labor of love. An open mind. A willing heart. The questions you want answers to. Comfortable clothing, including something you can workout in and, a new white t-shirt with short sleeve. Everything else is provided for you.